For the first time in my attempt to read all of Shakespeare's plays, I found myslef in the middle of one going 'what the **** is the plot of this play?' It's not that the plot wasn't clear, it's just that I, personally, got totally lost. I honestly will not accept all the blame for this (which is not to say I SHOULDN'T accept all the blame, just that I won't). This play is drawn from English history, and I think Shakespeare honestly kind of assumes the audience will have some freakin' clue what he's talking about before he starts. Which I don't. My knowledge of English history is pretty horrible, actually. So, I knew there was a War of the Roses, and that it had York and Lancaster as the two civil war sides, and that it had knights and stuff, but the rest? Not so much. So, yes, indeed, I will fully admit, I had to go lookup what the plot of what I was reading was about, at one point. I am suitably shamed. Perhaps this goes a ways to explaining why I didn't really enjoy this play. Which was sad, because I felt like I COULD have enjoyed it. A few of the characters felt really interesting, particularly Richard himself, whose verbal wanderings are at once maddening and fascinating. But, in the end, the story seems to be about a king who has no real talents or purpose, but who thinks God has made him king for a reason. The defense of divine right, I think is meant to be serious but, perhaps simply just because of the distance in time, feels preposterous. The guy is a terrible king! Isn't it a GOOD thing when he stops being king? This is the first in a string of plays about the War of the Roses. IT will be interesting to see if they make more sense as I go along. I've not read this but I am very familiar with the period - I'm a big fan of Katherine, John of Gaunt's third wife (I've read quite a bit about her, the royal line eventually descends through them), but anyway, I'm gathering this story is mainly about Gaunt's son Henry and Richard, and how as competing cousins, they hate each other, right? Richard waits until his dutiful uncle dies, then he disinherits Henry and takes all the Lancaster land. This pisses the people off and Richard is thrown in the tower where he's supposedly starved to death by Henry's half brother who happens to be in charge of the place, the banished Henry is reinstated and made king becoming Henry the fourth. I think it's generally believed Richard was a paranoid crazy, but really, weren't most of them back then? Probably because their own families tried to kill them. I want to read the next one too. Henry the fourth right? Amanda - You're ruining my Richard III review! Ms Lula - Yup, Henry IV (in 2 parts) is on my list next. I would really love to touch up my English history - I've long had a latent interest particularly in the English Civil War, Cromwell etc. Do you know good sources to learn British history from? AS for the play, ironically, it tries to play Richard up as this tragic character, and makes it really sad that he loses his kingdom. I felt like the guy was a lout, and was thrilled that Henry took over. I have plenty more I can quote for Richard III! I do no hesitate to look up plots and guides and criticism for Shakespeare. Nothing to be ashamed of! I am a bit scared of the history plays because I feel that would be necessary. PS How do you decide on the pictures for your posts? They're always so random! 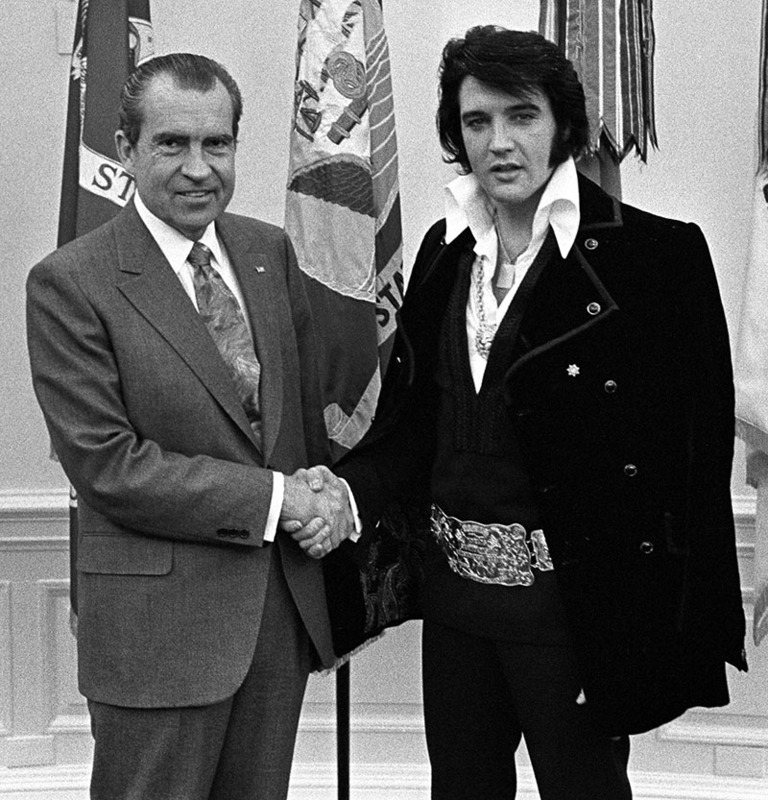 there really don't seem to be many pics of Nixon with a crown. i found one, and it was poor. OTOH, i did find good one merging Nixon and the Cowardly Lion. kinda of the "Richard The Lionhearted" image. i sus[ect the main problem is that Nixon was dead and gone before Photoshop came on the scene. Mr. Barca - It really SEEMS like it ought to exist, doesn't it? i agree. i know Nixon's yesterday's news, but there were quite a few people who had strong feelings against him. surely some of them later learned Photoshop. I haven't read Richard II, but was bored to tears when I tried to read Henry VIII. Then I saw the play performed and realized it's just a boring play. Richard III was the first Shakespeare play that I saw performed (by professionals at a Shakespeare festival) and it was amazing. I'd be curious to see if I'd be that enthralled if I was reading it (vs. see it live). Jason - historical romances. I learned just as much about history from Anya Seton and Philippa Gregory as any history book. There was also a Shakespeare festival not far from where I grew up that had a wall sized royal pedigree chart showing their many beginnings to Prince William. It was one cool chart. I learned a lot about their English histories, where they came from, etc. They are all related!